If you would like to migrate a LeoFS system, you can achieve that by following the operation flow. 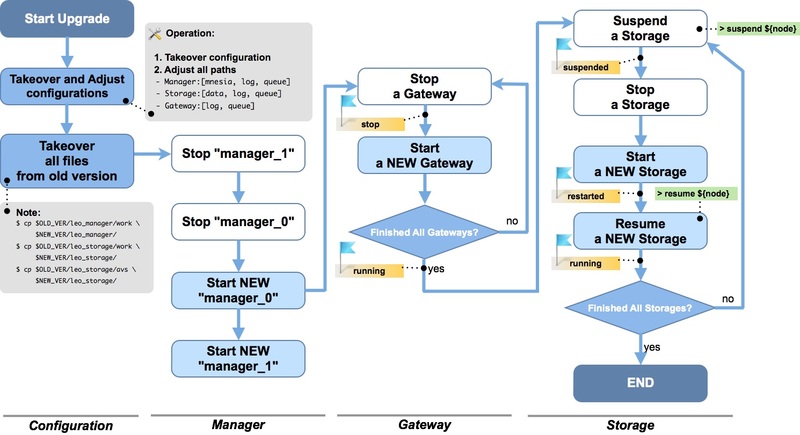 Before getting started with the migration of a LeoFS system, you need to take over the configuration, then adjust the paths and set the new configurations. It is possible to simplify this by storing node configuration in /etc/leofs, independent on version. Please refer to For Administrators / System Administration / Persistent Configuration for instructions on enabling and using this feature. [since v1.3.3] LeoFS' MDC replication feature was improved. Some configuration are added in the configuration of LeoManager's master. ##       and then replicates it by its contained reoplication method. [since v1.3.3] Data synchronization configuration are added in the configuration of LeoStorage. Starting from v1.3.8 there are changes in the official Linux packages. They should work out of the box for new installations and for new nodes on existing installations. However, one needs to pay special attention during upgrading existing nodes to v1.3.8. for all supported distributions: there is now symlink /usr/local/leofs/current which points to /usr/local/leofs/<version>, this allows fixed path to launch scripts, independent of LeoFS version (e.g. /usr/local/leofs/current/leo_manager_0/bin/leo_manager). Users that created symlink with that name themselves should remove it before installing new package. for EL6 / EL7 packages: installing multiple versions of LeoFS package is not supported anymore. There can be only one version of leofs package installed in system; new version should only be installed as upgrade, with rpm -U / rpm -F.
for systemd-based distributions (Ubuntu 16.04, EL7) special upgrade steps are needed. Stop currently running LeoFS node. Backup current config files for that node, if needed. Execute pgrep -a epmd and make sure there is no output, i.e. no instances of epmd are running. If there are any, kill them with pkill epmd command. Never kill epmd while LeoFS node is still running, though, because it will render it non-functional until restart. For EL7, execute rpm -q leofs and make sure that no more than single version of package is installed. Upgrade to new package version (dpkg -i for Ubuntu 16.04, rpm -U for EL7). After that, follow the usual procedure for LeoFS upgrade between versions. Job for leofs-epmd.socket failed. See "systemctl status leofs-epmd.socket" and "journalctl -xe" for details. (or, alternatively, system reboot will take care of this problem as well). These special steps are not needed for installing upgrades after v1.3.8. After upgrade, users of systemd-based distributions might be interested in switching to new way of launching nodes which offers improvements for system administration and new features like automatic startup/shutdown of LeoFS node on startup or reboot. Please read For Administrators / System Operations / Systemd Services for more information. Starting from v1.3.3, all LeoFS nodes are running as non-privileged user leofs in the official Linux packages. It should work out of the box for new installations and for new nodes on existing installations. However, for existing nodes upgrading to v1.3.3 (or later) from previous versions, the change might be not seamless. During upgrade of node (of any type), after stopping the old version and copying or moving every files to be moved into the new directories, change the owner with the commands below. It has to be done before launching the new version. Remove old temporary directory used by launch scripts. This step is needed because when earlier version was launched with root permissions, it creates a set of temporary directories in /tmp which cannot be re-used by non-privileged user as is, and launch scripts will fail with obscure messages - or with no message at all, except for an error in syslog (usually /var/log/messages). Start the node through its launch script, as per upgrade flow diagram. Don't forget to remove temporary directory (rm -rf /tmp/usr) as well for the reasons described above. These users might be interested in new features of environment config files, which allow to redefine some environment variables like paths in launch script. Refer For Administrators / Settings / Environment Configuration for more information. For those who have LeoFS already running as non-privileged user. Scripts that are provided by packages generally should be enough to run on most configurations without changes. If needed, change user from leofs to some other in "environment" config files (e.g. RUNNER_USER=localuser). Refer to the later section for more details about environment config files. Possible pitfall includes ownership of /usr/local/leofs/.erlang.cookie file, which is set to leofs during package installation. This should only be a problem when trying to run LeoFS nodes with permissions of some user which is not called leofs, but has home directory set to /usr/local/leofs. This is not supported due to technical reasons. Home directory of that user must be set to something else. Note that switching this node to run as non-privileged user later will require extra steps to carefully change all permissions. This is not recommended, but possible (at very least, in addition to chown commands from before, permissions of leo_*/etc and leo_*/snmp/*/db will have to be changed recursively as well). Tweak environment config files to set RUNNER_USER to the user you have logged in while developing with make release/bootstrap.sh/mdcr.sh. Remove all files under $PIPE_DIR before starting any LeoFS processes.